The separation of solids and liquids is a complex process that requires expertise and experience. 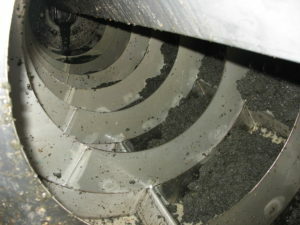 Welders Filtration Technology is the specialist in industrial filtration techniques. We design, build, install and maintain filter presses, belt filter presses, thickening tables and thickening drums. Explain your problem to our team and we propose you a solution. The preferred technique for the separation of solids and fluids for industries focusing on the purity of the final products and the importance of maximum separation efficiency. Such applications are in the environmental sector, the electroplating industry, textiles, metallurgy, pharmaceuticals, food industry, dredging industry and many other industries . The operating principle is the ‘dead-end-filtration’, which means the application of the maximum force to the filter cake resulting from the filtering on the filter cloth. This filter cloth can be selected to retain particles sizes from microns to millimeters. Filter presses are available in various designs and are always customized by WFT. 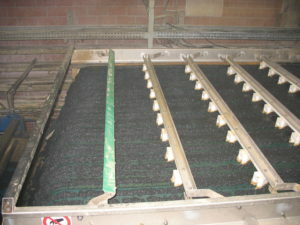 Sieve belt presses are used as a continuous filtration technique to purify both municipal and industrial wastewater sludge. They have a useful dewatering width of 500 to 3,000 mm, with 7 to 15 dewatering rolls. Thickening tables are used as a first separation step to filter low-concentrated suspensions . 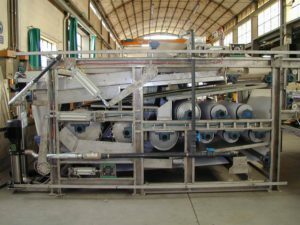 Subsequently the thickened product of the thickening table can be more efficiently handled with a (membrane) filter press or a sieve belt press. Thickening tables are a space-saving alternative to settling basins. Consequently the separation efficiency of the further filtration can be increased at a very low investment and operating cost. Thickening drums are an alternative for thickening tables in applications where the solid fraction by high fiber content easily sticks together into a consistent mass. Due to their compact construction and their smaller filtration surface thickening drums can be utilized for dewatering low-concentrated sludge flows to a capacity of 50 m³ / h.